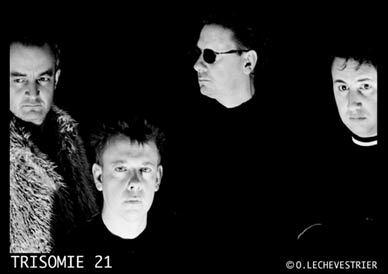 Trisomie 21 from France, named after a chromosome which causes the Down syndrome, built up a good reputation in the 80’s and early 90’s with a mixture of moody coldwave and atmospheric music, in which guitars, electronics and voices play an equally important role. In the last decade it was rather silent around the two Lomprez brothers, who founded the project. But now T21 is back, with a strong new album Happy Mystery Child and a performance at the Belgian Independent Music Festival. Singer Philippe informs us (sometimes a little cryptical) about the present developments around the band. An unavoidable question: This is the first T21 album in seven years. I read that an important reason was that you were not satisfied with your record label Play it Again Sam. They were not a good label for you? What you read is correct, Pias is not a good label. 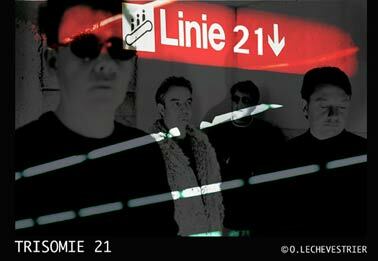 Ask it Front 242, Neon Judgement, Young Gods etc? They say the same thing about Pias. Pias only do one thing good when working with these bands. Pias only sees its own interest, they use each group, to make money, without any respect for musicians. What have you done in the last years? Did you keep working on music? We waited untill the end of our contract with Pias. When Indochine, the big French band asked us to remix one of there hits, we thought it was possible to try a new adventure. Does the new album ‘Happy Mystery Child’ has a central theme or mood? Compared to some of your older albums, I think the new album sounds accessible. Was that a conscious decision? Trisomie 21 don?t do a lot of things without consciousness. Happy mystery child is a concept album, we try to do something new for us, each album is a new face of our universe. HMC is the most reflected, elaborate and open album for us and perhaps the most valuable because this album sounds like we wanted to do. We use a refrain structure with melody, it’s a new way for us. I think that a song like ‘The touch of any flame’ is very suited to be played at the radio. Could that happen? Or are alternative and pop music too far apart? We hope that songs like ‘the touch of any flame’, ‘red or green’ or ‘midnight of my life’ can be played on the radio. In France, few radios play this songs. Though the sound of ‘Happy Mystery Child’ is different than before, I still directly recognize it as a T21 album. Could you describe what typical Trisomie 21 elements would be? All persons who listen to T21 tell us: you have a style and HMC is quite different but it’s a new T21 album, nothing else. We can’t be confounded with another group, perhaps the only thing I know: we don’t cheat! We try to be calm and conscious and we don’t like code and fitness. I think it is a very strong album. Are you satisfied yourself about it and with the reactions so far? We think that HMC is the most valuable album. We have the feeling, we succeeded in what we tried. Thank you for your commentary. I agree with you, we have lived this album. What inspired you when making the new songs? The source of our inspiration? It’s all we see, all we hear, all we read, we are alive and don’t live shut up. We sat down and forgot what we know, we remembered just emotions about life. Perhaps I’m mistaken, but I have the feeling that your new album generates more publicity than your previous one (Gohohako from 1997). Do you think that has to do with a renewed interest in new wave music? In 1997, we had to much problems with Pias. The communication was very bad, in consequence, gohohako didn’t interest them. It’s a special album like Plays the pictures, but the story with this label and us was the finish. I think that the new album generates more interest because it’s more accessible and stronger than the last one; the public feels this way. About the new wave revival, I think it’s necessary to make a break with the recent past. We turn over but it’s a crispation for the moment, we are free about that. 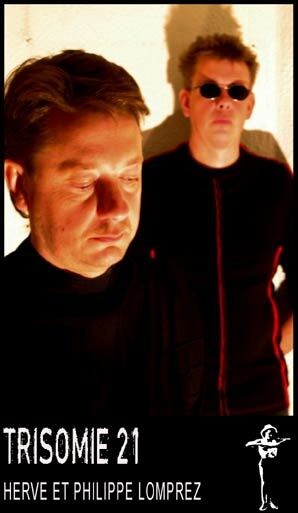 Various modern artists have done remixes for the new album. Do you think you can reach a young audience that way? We are proud of our project Man is a mix. It’s a party of ourself, we hope people like it. It’s a link between two styles, two worlds: the electro dark underground and us, it’s an experience. We want to gather all people. Music is not a religion, it’s a human being; touched by the end of God sometimes but human. Did you chose the remixers yourself? What is your favourite remix? Yes we chose the remixers ourselves. 29 real good songs by the greatest dj’s of the underground scene. If we took all songs, we liked all songs, each one for different reasons. Are there other musicians involved (in the studio and live) at the moment apart from Herve and Philippe Lomprez? What are their roles? In the studio T21 is 4 guys, Bruno Objoie plays guitars, Martin Blohorn, who arrived for this album: programation. 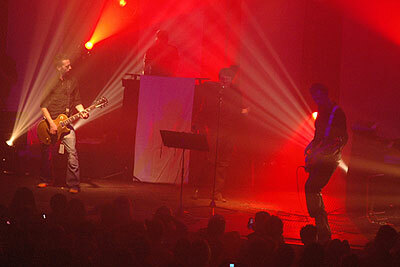 Hervé Lomprez composes the music and plays keyboards, guitars, bass, technicals and Philippe Lomprez: vocals. On stage Francois Pavan, from the group Park, takes the place of Bruno. 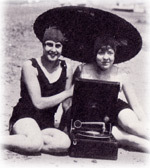 Trisomie 21 is known for using vintage equipment, but the new album also has modern sounds. Do you use the computer often nowadays? For Happy mystery child, Trisomie 21 uses vintage keyboards, digital mixer and direct to disk, we use technology which helps the song. Do you still record everything in your own studio? And is it true that you work completely apart from each other? Yes, it’s true, we have recorded a lot of our albums in our studio, mastering too for the last one. For the moment Hervé works with Martin and or Bruno, they compose music and Philippe directly sings, to take the first emotion, after all, the music is working by Hervé. As far as I know T21 did not perform very often live. Why not? The stage is not our job, we like the studio because we create something new, but for the first time, we are happy to make a tour, we like meeting people. What can we expect from the upcoming concert at the Belgian Independent Music Festival in Antwerp? Will you focus on the new album or will you also play old songs? We must play old songs like ‘la fête triste’ and ‘the last song’ and some of the new album like ‘red or green’ or ‘midnight of my life’. It’s just the second concert in about 8 years! I hope you don’t await a big show, we’re simply playing music, the stage is an answer to a request of the public but the stage is not our cup of tea. If I’m right it won’t take long before the band exists 25 years. Can we expect special celebrations? 25 years, for us it’s yesterday. We didn’t think of a celebration but it’s an idea, I call immediately our label and manager! Has the alternative music scene changed a lot since the 80’s? Yes and no. I am not a teacher of musical history but I think that electro dark music remembers us of the spirit of our beginning in 1980, we never listen a lot of music and we enjoy to be free. We hope to be loved for our work today, not for our past. We are in 2004/2005, don?t look back, the future is not behind us, we make music for today. Looking back at your career, what are the highlights? The highlights: the first album, the cover of Chapter IV, 1986 and our Canada tour, good news about ‘Plays the pictures’ and the last project HMC and ‘The Man is a Mix’. Are you still as passionate about making music as when you started? What keeps you going nowadays? Without passion, we don’t go on with Trisomie 21, it’s difficult to make music, we are exacting, we have a lot of respect for our public, each album is very elaborate. The basis of our music is our vision of the world, we take a look around us, alive and conscious of being, the music translates this feeling. Will it take another 7 years till the next album? Do you have future plans or a big dream to fullfil? I hope it will take not 7 years for the next album, but let us relish the last one, in spring we’ll see. Nothing special, I hope you like the last T21, come to our concert, we’ll be simply together, flesh and blood.